I worry about the lack of contemporary female heroes in my life. When I was in second grade, I did a presentation on Nellie Bly -- I even had this awesome hat that I thought was super historical, but was most likely just an absurd mess of netting and felt that my mom thought was funny. 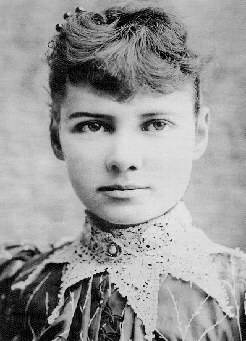 Although the book my school gave me on Nellie Bly was, well, for second graders, her story has always stayed with me. I just thought she was, and is, so god damned awesome. Her esposé of neglect and abuse at the Women's Lunatic Asylum in New York both fascinated and horrified me as a child; but it didn't surprise me, as far as I can remember. It seemed to make sense that authority, when unchecked and unobserved, would be cruel to those who they thought were weak and troublesome. PS: I finished my 2nd year of University with a 2:1 -- I think in American inequivalent, I'd be at 3.8 GPA? I'm not entirely sure; but I don't care, because whoo, 2:1! Fools! hey! i didn't think the hat was funny. i thought it was fun. it's like the opposite of wht you say about me, "mom, you're funny, but you're not fun". t, maero and i went out to a café yesterday early evening to celebrate your results. i ended up helping this poor woman who was with this man who was so drunk he couldn't walk, while of course everyone pretended it wasn't happening. how the tables turntable. dentist, as usual, was mystified by leah's tooth shape. she didn't bother explaining. don't imagine there'll be much call for that kind of information in the uk. email m the v rec.s if you haven't already. she misses you terribly. kelli arrives on the first. see if you can get some time off and maybe come over with t.r.e. yeah? I'm glad your school year is over Jmo, and happy for you that you did well! "Annie Oakley was born Phoebe Moses, to a poor Quaker family. Her father died when she was six. As a child she was known for her shooting skills, helping to support her family, by selling game to local shops and restaurants." mme, I'm sorry I let "Charles" go on and on for so long over there. His comments are now going into the moderation bucket where I keep one of my favorite Scoble comments of all time and an Aunt Hentic recipe for roast pig, in case I ever need it. Moderated comments available via email on request.